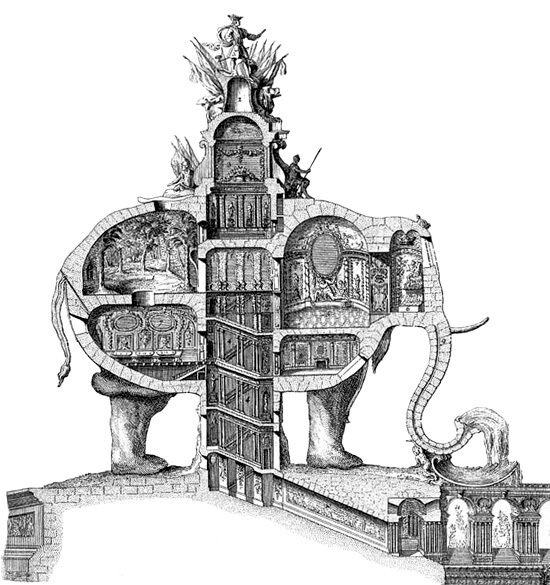 An air-conditioned landscape-within-architecture-within-landscape architecture-monument-landscape as proposed by the engineer Charles-François Ribart for the site where the Arc de Triomphe now stands in Paris. I personally prefer Ribart's. Where else can you now dine in a forest in the underbelly of an elephant? 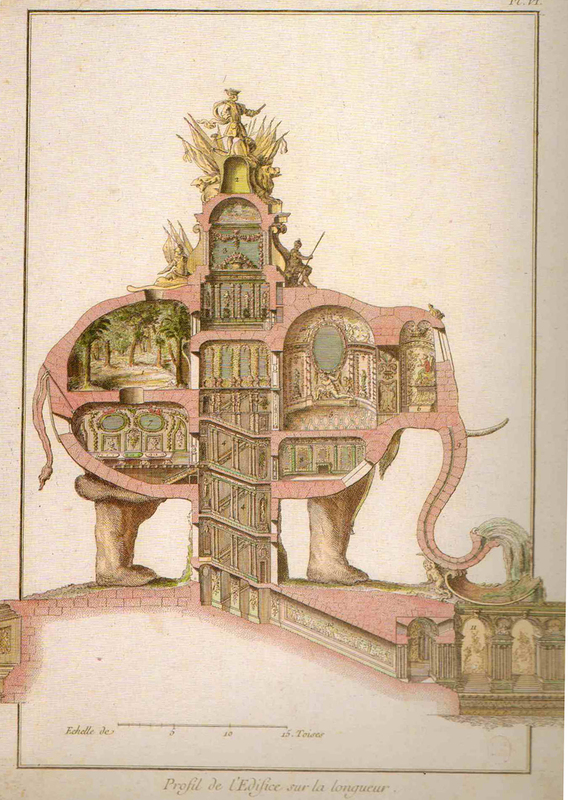 The mad modern Parisian traffic might be circling outside, but inside you're refreshed and calm, cooled down by an elaborate internal pachyderm hydrology. Evokes memory of the Coney Island, Luna Park Elephant Hotel. That's wonderful. It is like the Moulin Rouge elephant, but about a hundred times better. the answer is: you can dine in a forest in the underbelly of an elephant anywhere you can find an elephant in a forest. That is if you live in the underbelly of an elephant. anymore riddles? your blog is boss! thanks. Or perhaps Claude Bell's Dinosaurs as well. Now recently converted into a Creationist Park. And vicki: Will the elephant be roaming around? Nice if the scenery changes as you dine, a new landscape to match each course.